Last week, after the blog on “The Challenges of Preaching the Word” I had a couple of things happen that has helped create this idea for this particular blog. First, I had a pastor (David Bethel) to send me an e-mail basically discussing the sometimes ups and downs of disciplined study. He admitted that there were some weeks that all seemed to flow well and then there were other weeks of poor study due to the demands of the unexpected of pastoral work. Secondly, one of our members was in the hospital for close to a week and in addition to seeing her, I went down to the Radiology Department and saw quite a number of people that I used to work with. One of those days, I ran into one of the physicians (Sibley Turner, M.D.) that I used to work with and had a good time reconnecting with him. While I did not work with him as much as with some of the other radiologists, his partners almost to a man had told me numerous times that he had the sharpest mind of their group. So between this pastor and this physician, a thought begin to jell in my mind over the weekend concerning active study. The rigors of pastoral ministry can often be more reactive than proactive because you respond to things as they happen. Then there are times that time seems to drag by and those times cannot be wasted on the frivolous things that don’t really matter. That was what the pastor’s e-mail brought to my mind. The side that this physician brought to my mind again was not a new one. Medicine is a practice but it is a skilled practice that works with strong elements of knowledge. What a physician knows is often what makes him the healer that he is. Far too many patients are always worried about the bedside manner of a physician and while that may be important to some, it is not crucial. What is important is how much knowledge does he have and can he take that knowledge and use it with skill to correct the malady he is treating. To do this there has to be a life of constant study and refreshing of the mind. A physician does this with medical journals, seminars, and collaboration with other physicians. A preacher will do the same thing with his prayer, his study, his Bible, and his books. The first thing to know about study is that it is hard work! My own interaction with study has caused me to realize that one can be extremely inspired about working through a passage, book of the Bible, or even a topic but when it gets down to digging it out, it is hard work. Much of inspiration is perspiration in fact one man said that inspiration is 90% perspiration. Many men can get inspired about taking the Bible and preaching through it and then do not settle into the hard work of staying in their chair to work it out. If you are constantly in and out of your chair, nothing of eternal value is ever going to be accomplished for just about the time the smooth flow of inspiration is mixing with the interpretation and interruption causes it to fail. I always have a bit of hesitation about telling you how I do things personally simply for the fear of appearing presumptuous and a know-it-all. However, I also know that I have gleaned much from other good men who were willing to share with me their own habits and patterns which made me a better man. Now I realize that those who listen to me preach/teach every week may be wishing to goodness that it would get shorter and better but all in all they keep coming back every week (which is good). I am currently working on a long series that I have spent more time with than any other venue in preaching. I have been working on 1st John since January 2007, although it has primarily been on Wednesday nights and every other month at that, I still have spent 45 nights on this series. I have 21 sets of notes on this particular book and have logged more than 160 hours in preparing for these 45 sessions. If you use Microsoft Word, you can look under the Properties tab, under the Prepare section and you can find out the exact word count of the document and how long you have been working on the notes. 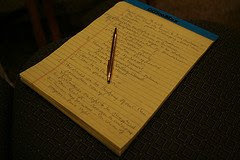 For the 1st John series, I start with a legal pad and scribble out the notes and then compose it into the Word document. So whatever time is shown, there is actually more time involved because I have worked through the passage and worked through commentaries prior to creating the document. In addition to this long series on 1st John, I have taken breaks from it. During those breaks, I have pursued other subjects. I have in started a series on the OT Tabernacle on another legal pad which I intend to start either late summer or early fall after I complete 1st John. The first lesson is complete and is simply waiting. In the meantime, I have allotted some time to work through this very rich subject, when I am not studying 1st John. I have another legal pad that is in the early stages on the life of Elijah. In addition to this, I am frequently preaching single messages on single passages primarily on Sunday nights. 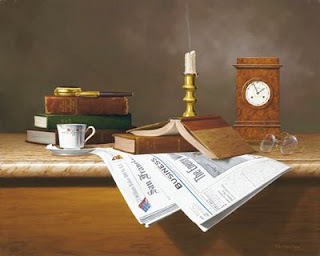 To do the hard work of study, you have to be very judicious about time. In fact, time is your most valuable commodity. I have worked very diligently to keep the mornings clear and free so that I can use those to pray and to study. My afternoons are usually spent with various other responsibilities but I always try to keep the mornings free to study. Great preachers will be great students. Great students are more often than not great readers. A great student will understand the commitments of time needed to work through this important task. The hard work of study causes one to be observant every day. Potentially every aspect of a preacher’s life has the availability to become a good illustration or opening introduction to a sermon. You have to look about your path because there are pearls all around hidden in oysters and there are diamonds in the rough that long to be picked up and shaped into something useful for the congregation. The hard work of study keeps sermons fresh. The hard work of study will also help you to be a worker who will stand without embarrassment before God (2 Timothy 2:15). . . . I recently ran across a conference message by D. A. Carson concerning this challenge of preaching the Word in our generation. While I do not find complete agreement with all Carson considers, he had some very worthy points to mention in his address. I took his list and then expanded on some of the points. Carson listed the following reasons that the Word is difficult to preach in our times. A mad rush toward secularism. Secularism basically is a fit-all term that holds that church and state, politics and life should be completely separate. Compartmentalize your life and keep your devotion to God a secret so that it does not affect anything that you do. Therein could be an explanation of all the corporate collapses we have recently experienced and other legal violations in the banking industry. Secularism works very actively to squeeze religious life into the periphery so that it does not “offend” someone who does not necessarily hold a biblical worldview. The stakes are high when the Bible does not have a centerpiece in our life. Rampant immorality, escalating divorce rates, children born out of wedlock, widespread dishonesty, and this is just a short list. A loss of confidence in the authority of the Bible. Scholars and seminary professors are continually working to break down the authority of the Word. Hence there is a widespread dependence on counseling and other methods to “help” folks get out of their dilemmas. Whatever happened to God? Whatever happened to following the commands of Romans 6? Whatever happened forsaking the world that one came out of? Scripture still has the ability to grant direction in life but as Paul said in Ephesians 4:17-29 (a mirror passage is found in Colossians 3:5-17) there will be some things to “put off” and “put on.” Behavior modification is not spiritual transformation. The only way that spiritual transformation is helped is from a deep confidence in understanding the Bible as God’s Word. Preaching has declined. Honestly consider the kinds of messages heard today with those heard even 20 years ago. The focus today has become ‘Atta-boy, you can make it!’ or ‘God’s gonna bless you!’ or some life-application sort of thing that will help deal with (you fill in the blank). In years past, the message was thoroughly biblical in its scope and we are missing that now. I realize that when I blog things of this nature that some perhaps would have a tendency to think that I have a sour-grapes syndrome. However, more than anything I am pleading for preachers of all ilk to return to their knees in prayer, their Bibles for deep devotion, and their books for rich study. Then dig out fresh manna for starving congregations. There are some good models of solid biblical preaching out there. . . Find them and devote yourself to the exposition of Scripture. There are two gods the Word is contending with in our times; pluralism and relativism. Pluralism basically tells us that all roads will get you to the Happy Hunting Ground. All religious persuasions are right and proper. Therefore Islam (or any other ideal) and Christianity co-exist for the same reason and that is to save man. Relativism decries anything that attempts to say that there is no absolute truth. For these two reasons, one has to understand that the Emerging “church” is not a fad because it is far larger in its scope. Its ideals have literally engorged itself on the postmodern culture and are fitting God into its ideas instead of making its ideas fit God and His Word. The role of the pastor has changed. Now he is expected to be a counselor, organizer, CEO, and group therapy leader instead of a preacher of the Word. A pastor’s primary calling is preaching and praying. While there are other obligations that he has to subscribe to, his foremost calling is that he will be given to prayer and ministry of the Word (Acts 6). The man who does not pray and study will find his preaching becoming flatter and increasingly like a stale loaf of bread. In Thom Rainer’s book Breakout Churches, the discovery about truly effective churches was that the pastor spent at least 20 hours a week in prayer and sermon preparation (p. 42). If a church is going to grow both spiritually and numerically it will be for the simple reason that the pastor spends time with God. The rise of television and mass media has engendered an attitude toward entertainment and puffy professionalism. Very few men who preach week-in and week-out have the ability to compete with the glossiness of the talking heads that dominate the airwaves in our days. Furthermore it has reduced the attention span to such a degree that it is difficult to be able to speak to a group for 50 minutes and have them continue to stay with the message. This is the day that many will watch a three-hour football or baseball game and decry even a thirty-minute sermon and this proves where our priorities have degenerated to. A broken culture. Everywhere one looks there is devastation around them. No church (if it has even 20 people attending) is immune from the troubles and dilemmas of life. Broken marriages, broken homes, broken vows, broken dreams, broken men and women, and broken children dot the landscape of every church because of the decline of our society. This dilemma can be disheartening because the preacher starts working toward the felt needs of people and this never allows God to be exalted in His sovereignty and providential workings. God no longer becomes central because all of these single issues marriage/divorce, family, job, stress, financial management, and others are allowed to dictate the landscape. My desire for you is that you would shake off the press of culture and give yourself to preaching all the way through the Bible before you pass on. There is much nobility that can come from this sort of goal in the life of a preacher. Several years ago, E. E. Jolley pulled his famous line on me. “This page is worth the price of this book! 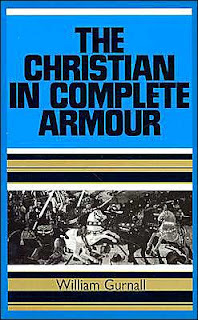 If you don’t get something out of it, send it back to me and I will give you a refund.” In his hand, he was holding the second volume of the abridged “The Christian in Complete Armor.” Needless to say, I bought the little three volume set of paperbacks and have gotten my $27 worth out of them a long time ago. My paperback collection has become tattered, dog-eared, and marked up over the years and I have gotten a lot of inspiration for preaching from it. There are some very good things concerning Lot and his relationship with Sodom and Gomorrah. The abridged books contain much food for thought that will provoke your thinking. Following are some quotes that may whet your appetite for considering this book for your own library. Of Satan ‘s Subtlety to choose out the most advantageous Seasons for tempting. . .
1. The first season he takes to tempt in is, when newly converted. No sooner is this child of grace, the new creature, born, but this dragon pours a flood of temptation after it. He learnt the Egyptians but some of his own craft, when he taught them that blood and cruel baptism, which they exercised upon the Israelite babies, in throwing them into the river as soon as they were born. 2. Secondly, When the saint is beset with some great affliction, this is as some blind lane or solitary place, fit for this thief to call for his purse in. 3. Thirdly, When the Christian is about some notable enterprise that ye may be able to stand for the prize for God's glory, then Satan will lie like a serpent in the way, an adder in the path, that biteth his horse's heels, so that his rider shall fall backward. 4. Fourthly, When he hath the presence of some object to enforce his temptation. Thus he takes Eve when she is near the tree, and had it in her eye, while he should make the motion, that assaulting two ports at once, it might be the harder for her to hinder the landing of his temptation ; and if Eye's eyes did so soon affect her heart with an inordinate desire, then much more now is it easy for him by the presence of the object, to excite and actuate that lust, which lies dormant in the heart. 5. Fifthly, After great manifestations of God's love, then the tempter comes. 6. Sixthly, At the hour of death, when the saint is down and prostrate in his bodily strength, now this coward falls upon him : 'tis the last cast indeed he hath for the game, now or never, overcome him now and ever. As they say of the natural serpent, He is never seen at his length till dying, so this mystical serpent never strains his wits and wiles more, than when his time is thus, short. All of this came from an un-abridged volume that you may download in a pdf format for free. Uhhmmm. . . . George, I Couldn't Care Less What You Think. . .
A long time ago, I was interested in what George thought. You see, George, and me, and all of his nifty little stats were going to help me do the will of God and build a huge church (thank you, Jesus!!!). George had insight. George had savvy. George was cool. George had his hand on the pulse of America. He knew what the Boomers, Busters, X’ers, Y’ers, and Z’ers thought about the Church, God, and His Book. But when Bill repented for following some of George’s ideas, we all stopped and paused for a minute. You see, Bill, had accrued a monstrosity that every “spiritual and motivated” pastor ought to be trying to build. The Willow Creek model (interestingly outdated now) was cutting edge until they found out that very, very little spiritual growth had been going on in their little nexus of spiritual wizardry. In fact, George’s surveys had caused Bill’s sermons to go awry because Bill was questing in hot pursuit the theories that George had found out. However, what Bill did not know was that George was talking to spiritual aliens who did not know beans about God and the Church. Basically what happened was that Bill built a crowd instead of a Church. Huge numbers, parking lots, buildings, and nifty drama and media presentations but low on biblical content and authentic Christianity that little transformation, if any, really took place. You might think that this opening salvo is tongue-in-check and it probably is but the fact remains that George Barna probably is doing more harm than good. His stats are intriguing to say the least but in reality when you take surveys from people who hardly know God or His Word or how to pray, the answers can mean trouble. What his answers are doing to a lot of good men is causing them to alter the content of the Gospel. Doing so can be about like giving the wrong medicine or treatment regimen to treat a lethal heart rhythm. In the medical world, you do that too often and you will get sued for malpractice but if you do it in the church world, you probably will get an award and great acclimation for being tolerant. Such is the case with one of the newest books that the Barna Group has published. It is a conglomeration of voices who in the end sound like a wild cacophony that are going to lead me further astray than help me determine what God has in mind for His Church. The accusations are wide-ranging and hot-button and although they may be sincere in the views, they are sincerely wrong. The survey decides that the Church is too hypocritical and judgmental. To which I would say that any time that one tries to justify sin in their life anything that convicts them of their sin will almost always be accused of hypocrisy and being judgmental. A church that is separated from the world (which is a biblical doctrine) is going to have its share of critics. The survey decides that the Church is too interested in evangelism. The whole purpose of the Church is for world evangelism. While the “Church” (I use that term very widely and probably too inclusively) sits by and is no longer aggressive with evangelism, the Islamists are working day and night to literally encompass the globe with their own brand of darkness. The survey decides that the Church is “homophobic” and anti-homosexual. In reality what is occurring is that a strong message is convicting men of their lifestyles and they do not like the call of grace that is longing to transform them. The cry is for tolerance and acceptance when the fact is that no man, no matter how educated or how large his church may be, has the right or ability to change the call for obedience in Scripture. Also, the Church is too political in attempting to stop abortions and call for judges that will at least vote on the side of decency and morality. If one listens too long to what George wants you to be and do, it will change the whole scope of the message. Here are the facts. . . man is a sinner. . . he is lost. . . he will face the judgment of God. . . the only salvation that can occur is through the New Birth provided by a work of the Spirit through Jesus Christ (John 3:3-5; Acts 2:38; 10:44-48; 19:1-5) and then a call to separation from the world. 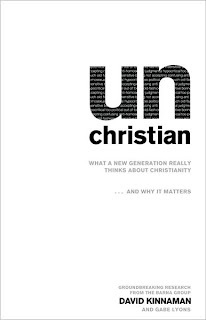 By the way, save your money unChristian is a book that will be bottom shelf in a short time. . . .
Ministry and medicine have a lot in common (although I am not sure if the faith healers would agree with me or not). Sometime ago I was involved in a procedure that was blissfully incredible. A patient had been having problems with extreme weight loss, nausea and vomiting, general malaise, and a lack of appetite. After the attending physician had determined through a CT scan that the patient did not have an underlying cancer diagnosis, it was determined that they possibly had some called mesenteric ischemia which is a fancy medical doo-dad term that basically says “the gut is not getting any blood.” So off we went in the chase. During the procedure, my job was to keep the patient asleep with hefty doses of IV narcotics and monitor their cardiac status as we attempted to find the problem. As the procedure progressed, four sets of eyes in the interventional radiology lab saw the problem. A small but very vital mesenteric artery was about 90% closed off and our job was to fish a wire across this lesion and put a titanium stent in place to hold it open. Very tedious and very dangerous would probably sum up the whole affair. However, in the end a warm fuzzy story developed with the all of the symptoms subsiding and the patient returned to quite a productive lifestyle. But another day came. The same four sets of eyes, the same drugs, the same monitors, the same equipment, everything was the same and luckily in the end the same outcome. On this day another patient presented with similar symptoms. There was a high grade blockage that created a tremendous insult in the blood flow leading to terrible and painful symptoms for the patient. We managed to snake a “road-runner” wire across the lesion. Then that was followed with a catheter which was followed by another stiffer wire which helped us to advance a stent to prop open the blockage. But the tricky part about this sort of thing is that when the balloon containing the stent is opened up, the blockage is can be like shards of glass. On this day, we had the same expectations but a much different outcome. When the balloon was about 80% opened and the stent was sealing against the wall of the artery, the artery dissected. The patient’s blood pressure suddenly went from 120-130/60-70’s to the systolic number (the one of top) being 60-70. The heart rate went from the 70’s to the 140’s almost immediately. In addition, under continuous X-ray we could see the artery “hosing” blood. This is life in the real world, much unlike the fake stuff you may have seen on TV. We did manage to get a stent-graft in place and after about 45 minutes the situation righted itself and everything returned to a somewhat normal state. The expectations placed on a pastor and his family by themselves and by others combine to make a cumulative list of musts that is often unbiblical and unreasonable. This is because the expectations are both numerous and contradictory. Every person in a given congregation comes to the church with differing backgrounds. Some are old. Some are young. Some come from rural churches where they were involved in almost every facet of their church’s life. Others come from large suburban churches where there was a program for everything. Some come from no church background and therefore don’t know what to expect, bless them! The pastor has his own background and his own heroes. All this means that there are a hundred or more different lists of expectations of the pastor. Sooner or later, the pastor finds out about all of them. Since his professional well-being rests on the good will of the people he serves, he does his best to meet this cumulative list of expectations. These unrealistic expectations escalate until the shepherd finds breathless and exhausted or more often than not, sheep abuse occurs and the sheep have to endure the frustrations of a wearied shepherd. Sheep get bruised and the devil loves to take advantage of this by encouraging discord or the sheep simply dying. The shepherd in trying to keep up with this cross, he finds a frenzied pace of life that is destructive at best. Almost imperceptibly the harder they work to keep up with the pace the more obligations and responsibilities are sent in their direction. In the long haul of ministry, prayer ceases, inspiration for preaching dies, kindness disappears, joy erodes, dreams die, and visions languish and it is not long before the shepherd becomes a shell of a man that simply longs for the finish line to appear somewhere on the horizon. As a reader, you are probably thinking that this is a reality in shepherding a flock but what must be done to relieve the situation. I have discovered a few things that helps when you are faced with unreasonable expectations both those that are internal and those that are external. 3. Understand the “seasons.” There are seasons that every church and life will go through. The devil uses these “seasons” sometimes to our own spiritual detriment by allowing a creeping frustration of unrealistic expectations to develop. While God may be using the season to teach us an important lesson of life, it is missed because we do not understand the seasons. I have discovered that this is where prayer can be crucial because God can literally open up an understanding to help you to “see” what is going on in your venue. I shall continue this series next week. . . thanks for stopping by to read. . . . This single sentence and question so arrested my attention several months ago and I have not been able to get away from the thought. This is a reprint of some lectures that Jefferson gave in 1912 to a group of pastors. He never explains what he means by the “shepherd’s crosses” in the lectures, but his thoughts on the crosses that a shepherd bears has been on my mind for several months now. Does a shepherd have crosses that others do not have to bear? Are the crosses of a shepherd heavier than that of others? 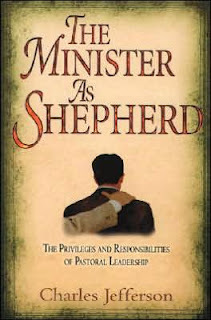 How closely do the responsibilities of the physical shepherd mirror that of the work of a pastor? All of these questions begin to lead me down a path of thinking that has been rich in imagery but it has also been frightening in understanding the depth of responsibility that a pastor has as an obligation to the church which he serves. A shepherd in the physical sense has a number of responsibilities that he must continue to work over and over in a very routine sense of faithfulness. Be very clear about one thing, the devil (yes there is one) is very intent on lulling the shepherd into a state of boredom about his responsibilities. He can make the shepherd think that it is enough to keep the lights on and the doors open and never do anything more rigorous than that. However the shepherd is responsible for the health of the flock, the housing of the flock, the feeding of the flock, and the reproduction of the flock. All of these responsibilities can be found Scripture (Psalm 78:52-53; Jeremiah 33:12; John 10:1-16; Matthew 25:32; Genesis 29:2-10; Numbers 32:16; 2 Chronicles 26:10) and it is important that they be understood in the process of raising sheep. 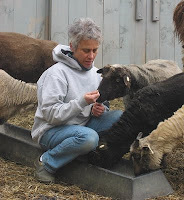 Sheep have two primary enemies: internal parasites and predators. One of the crosses a shepherd has to bear is the continual treating of these internal parasites. They can be controlled with two different practices. He first of all must treat them with a medicine that mirrors the work of antibiotics. Secondly he must rotate the pasture that they feed in. Uncontrolled parasites can lead to infestation in a flock and will have a ruining effect on the health of the young lambs and occasionally on the adults. Not only does it lead to a constant sickness but it has the capacity to be fatal. A lack of faith that is dependent only on past victories. Every flock needs to have some recent victories that they can look to and clearly see what God is doing in their midst. Victories that were enjoyed 10-15 years ago are not going to suffice for a flock. One cannot coast on his past! There is a faith that can be inspired by that shepherd if he will give himself to the ministry of encouragement. Another parasite that has to be combated far too often is that of gossip. More often than not gossip can lead to a deadly disunity that will affect the entire church. What does the Bible encourage us to do about those who are gossips? Give them some pretty strong treatment! Avoid them (Proverbs 16:28; 20:19; 1 Corinthians 12:20-21). Gossip has a tendency to put a flocking instinct into the sheep and they will group up and digest some of the more vile pasturage around. The worst part of gossip is that is often untrue feeding off of half-truths leading to discord among the flock. A fighting flock will always be restless, will lose weight, and will not reproduce. The parasite of a hard heart has to be contended with. A hard heart never responds to the good seed of the Word. The seed that is scattered by the hardened wayside will be scooped up by the birds before it ever gets a chance (Matthew 13:4; 13:19). The shepherd has to spend much time praying for those who are hard of heart. He also must be careful that his own heart does not become hardened by a jaded cynicism at the results. Other parasites that the shepherd has to contend with are bitterness, jealousy, vengeance, busyness, and discouragement that will pull the life out of the sheep. He will have to contend with a gluttony that is ever full but always empty. He will have to bear those who are fearful and depressed which leads to spiritual weakness and anemia. All of these parasites are evident in every flock and they must be handily dealt with or much damage will be at hand. One of the things a shepherd needs to remember is that maturity in a sheep reduces his liability for a parasite to harm him. This is encouraging for every shepherd who realizes that the longer one continues on in their spiritual walk in Spirit and Truth the more spiritual maturity can be acclimated in their lives. This should create a desire for a shepherd to be diligent in his faithfulness to his calling. 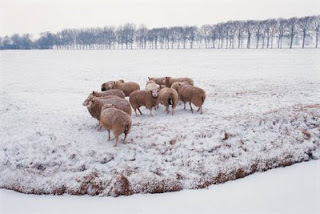 Another thing that is helpful for the shepherd to understand is that there is a “safe pasture” which is low on infection. He can allow his flock to grow in these types of pasture. They are conducive to both spiritual growth and numerical growth and have an atmosphere of faith and revival. 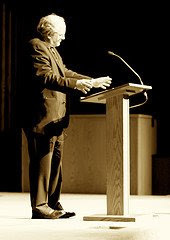 For those who are concerned with what is occurring on the national landscape within the apostolic ranks, the best thing that can happen to affect the national level is for the local “pastures” to take the necessary measures to turn their attention toward creating “safe” pastures with increasing emphasis on doctrine, separation from the world, and revival preaching and worship. Just as there is a “safe” pasture concept there is also a “dangerous” pasture. “Dangerous” pastures cater to diseases and demises of flocks. As for rotating the pasture for the flock, this is a must. A very careful shepherd will maintain steady vigilance over those with whom he allows to preach to and interact with his flock. The other aspect of rotating the pasture has to do with the content of that shepherd’s ministry of the Word. 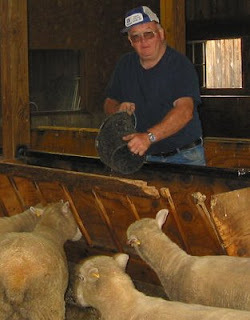 While I shall not belabor the point on expository preaching, I will encourage every shepherd to invest himself in this very productive effort so that the health of the flock is maintained. 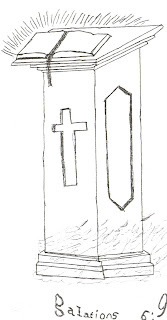 I shall work with another aspect of the shepherd’s crosses in another post. Thanks for stopping by and reading. . . .
Blaine Allen has managed to do it again. Allen is one of those authors that I “accidentally” found a few years ago when I was trolling our local Lifeway Christian book store. He has previously written a book entitled “Before You Quit: When Ministry Is Not What You Thought.” That book was a good one and it comes from the heart of one who obviously knows what it is like in the trenches. 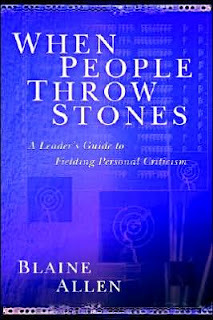 His second book “When People Throw Stones” is also a very worthy follow-up to his first book. Again, you don’t have to read two pages into the book before you realize that man has worked through some acreage to be able to write as he does. Pastoral ministry is challenging at best but it can be even more of a cross when the words of critics pour out toward the man who is attempting to guide a church. Recently I was on the other end of a pastor(s) conversation who shared with me the dilemmas they are facing in having to endure some very sharp, unwarranted, and malicious criticism from the churches they are attempting to serve. This is probably what prompted me to buy this book last week because I am well aware that at some point criticism will come the way of anyone who is diligently trying to serve God. Why are we at this point in our society where criticism can put a pastor’s soul into wreckage? Especially in the setting of the Church, a place where it shouldn’t be. It goes on day after day. Then into weeks and months. And before you know it, years pass—life with it—and you still knead the pain (of the critic and their criticism). Like a mallet you pound away. You beat it hard, sometimes harder than at other times, but always hard. First thing in the morning. Anytime a conversation shows the slightest drift in that direction you grab hold and set its course: do you know what he did to me. . . ??? Pound, pound, pound, pound. But, do you know what you are pounding? Your own heart. With each blow, it gets harder and harder. Packed like steamrolled dirt. The air cannot get to it. The seeds of new truth won’t germinate in it. What good growth remains won’t be there much longer. The roots can’t spread. The moisture of the Spirit does not reach it. The tender shoots of truth get clobbered one by one. That’s the danger for a servant who ignores God’s roles behind the scenes (pp. 61-62). • Truthfulness: Is your critic trustworthy? • Empathy: Is your critic concerned? • Competence: Is your critic knowledgeable? • Factualness: Is the criticism accurate? • Restraint: Was the delivery of the criticism restrained? • Pain: Does the criticism hurt? I realize the economy is shifting daily but this book might be a worthy investment of your time especially if you are on the receiving end of criticism right now. Otherwise, it might be a good book to get to read to prepare you for the future, because I have discovered that no man is immune from this kind of activity. I am also linking some previous blog posts to this one concerning church problems. Part One and Part Two.